The 15th World Cup was played in United States from 17 June to 17 July. The final stage of FIFA World Cup was preceded by a qualification that included 147 national teams. Among these 24 would go on to the World Cup final tournament, including the automatically qualified United Stated as the home team and Germany as the reigning champions. Greece, Nigeria and Saudi Arabia had succeeded in qualifying for the first time. 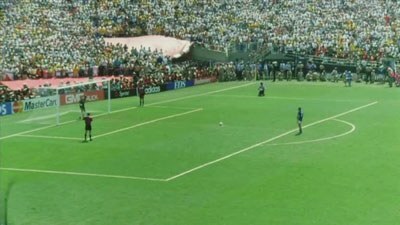 Since the 1990 World Cup had produced the lowest goals per match figure ever in the tournament, FIFA made some changes with the idea to create a more offensive game in the 1994 World Cup. The goalkeeper would no longer be allowed to take up the ball with his hands if the ball had come from a teammate. Another rule change was that a player that fouled another player with the ball and only the goalkeeper between himself and the goal would get a red card. A third rule change was that a team gained three instead of two points for a win. Referees had also got instructions to be harder on fouls and the line referees were instructed to blow for offside only when completely sure (a somewhat strange criterion). Apart from the new rules the referees would for the first time no longer wear traditionally black shirts. The rule changes reach their goals in terms that the 1994 World Cup was characterized by attacking game, relatively speaking, the goals per match were actually not much higher than in 1990. Same set-up was used as in the previous World Cup tournament. The teams were divided into six four groups from which the best two teams in each plus four third placed teams advanced to a knockout phase. The 1994 World Cup was played in nine cities and with the same amount of arenas. For the first time some matches would be played indoor, in the Pontiac Silverdome. The two biggest sensations in the tournament were Sweden and Bulgaria. Sweden, elevated to a new level by players like Tomas Brolin and Martin Dahlin, was near their second World Cup final and Bulgaria, with the Barcelona player Hristo Stoichkov, could have reached their first. Instead, the teams would meet each other in the match of third place. The World Cup trophy would once again be lifted by Brazilians players and their striker Romário was arguably the biggest reason to it. The last game was, however an example of how hesitant and careful a final in big football tournaments sometimes tend to be. Two events that not occurred chiefly on the pitch shadowed the sporting aspects. The first was Diego Maradona that abruptly departed from the tournament after testing positive for ephedrine, a non allowed substance used for weight loss. Maradona had made a comeback in the Argentinian national team and had lost 20 pounds in a short time. He showed some brilliance on the field against Greece, but Argentina had to manage without him in the remaining matches (his substitute Ortega, who presented a playing style which mirrored Maradona's, got instead a breakthrough). The second event that gave a shadow over the tournament was the gruesome murder of the Colombian defender Andrés Escobar whose unlucky own goal against United States would lead to him getting murdered after he returned to Colombia. 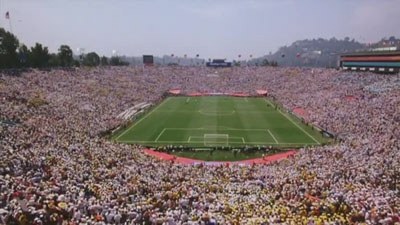 The mighty Rose Bowl stadium is packed. 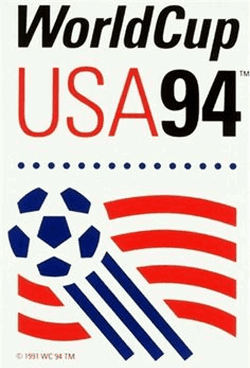 FIFA World Cup 1994 would include 52 matches in which 141 goals were made (2,71 goals per match). A new record in the tournament's history was made by Russian Oleg Salenko who became the first player to score five goals in one match. Another record was set by the Cameroonian Roger Milla, who became the oldest player (42 years and 39 days) to play in the tournament. Brazil would defeat Italy in the final and for the first time in World Cup history the final match would be a draw after both ordinary match time and extra time. The match would therefore be decided by a penalty shootout in which Brazil won after Italy had missed their third penalty. Penalty shootout in the final.